Do you live in Anchorage, Alaska? You can pick up Six Generations card game from the publisher's store! VISA, AMEX, MASTER CARD, DISCOVER credit cards and PayPal are all accepted at PayPal Checkout. 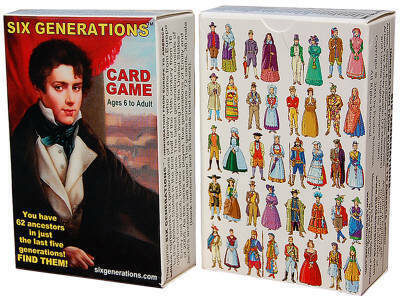 SIX GENERATIONS is a registered trademark of Six Generations card game . Order more sets and save on shipping! 6 sets of 2 (total 12 games) or more sets - FREE SHIPPING. Each 6 games are packed into the state-of-the-art display box .